In football, basketball and even baseball these days, an athlete’s size is essential in getting noticed. In fact, oftentimes talented athletes that do not fit the typical mold are overlooked, despite their talent on the field or court. But for a sport like soccer, the focus is mostly on endurance, finesse and speed rather than size. At Cathedral Prep and Seminary, Elmhurst, sophomore forward Danny Goncalves is proving that size does not matter in soccer. 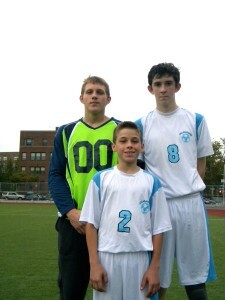 Standing at just four-feet, nine-inches tall, Danny certainly lacks the frame of some of his teammates and opponents. While God may not have blessed Danny with size just yet, He did give the budding star a huge heart. The Astoria native attended Immaculate Conception Elementary School, and his family still attends the parish. 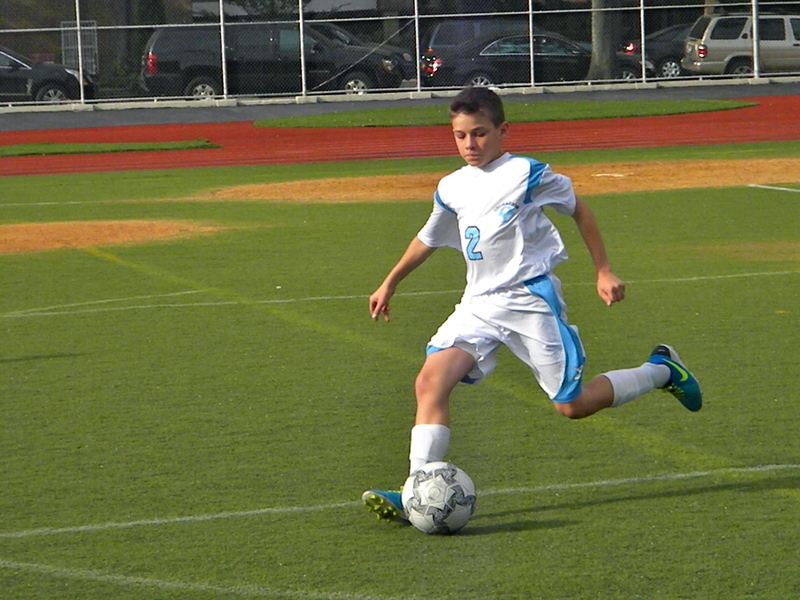 He played Catholic Youth Organization (CYO) basketball there, but his CYO soccer came at St. Francis of Assisi, Astoria, since Immaculate Conception did not have a soccer team. At Cathedral, Danny is a guard on the basketball team and a second baseman on the baseball team, but he said his first love is soccer – the sport that he has played since age three. Danny’s father was born in Sao Paolo, Brazil, and lived there until age 26. In Brazil, soccer – known more commonly as “football” – is easily the most popular sport. Based on his height, Danny is often underestimated by his opponents. 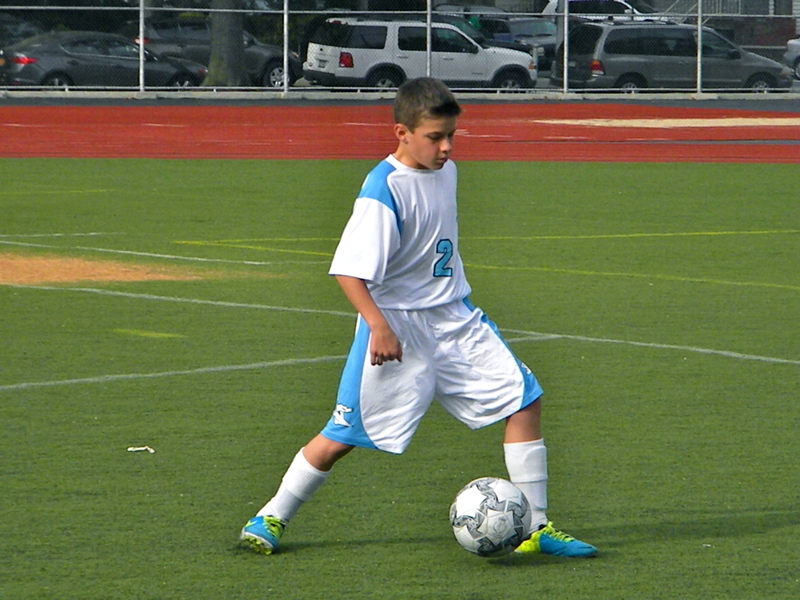 But they soon learn that Danny possesses all the necessary skills to succeed on the field. Danny actually believes that his size gives him an advantage while competing. He has plenty of energy, so his body does not break down as fast as some of the bigger players. Also, he moves so fast on the field that his opponents often lose track of where he is at any given time. “When we’re playing or practicing, I always seem to pass everybody quickly, and it’s hard for them to put their foot out to stop the ball,” he said. Junior defenseman and team captain Brendan Gallagher has the responsibility of motivating the Crusaders before heading into a competition, and he said his job is much easier with Danny on the team. 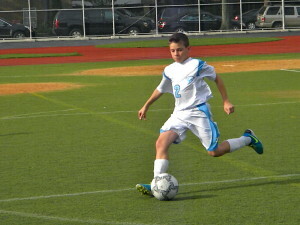 Danny’s main soccer strength is his dribbling ability. While he certainly can score goals, he said he loves setting his teammates up for scoring opportunities. “It’s almost like he’s break-dancing with some of the moves he makes,” said Crusaders’ head varsity soccer coach Will Scharen. Scharen said that when Danny tried out as a freshman, he was a little bit worried based on Danny’s size. But Danny’s grit and determination have led him to become the sparkplug of the team, as his coach called him. Danny looks up to Argentinian forward Lionel Messi as his role model. Messi stands at just five-feet, seven inches, yet he is the captain of Argentina’s national team and widely regarded as the best soccer player in the world. But Danny was quick to point out that when Messi was in high school, he stood at four-feet, 11-inches – further proving that size does not matter in the sport. In addition to his athletic skills, Danny excels in the classroom and is ranked near the very top of the sophomore class academically. His teammates view him as their role model, even though he’s the same age or younger than most of them. Danny’s teammates certainly look up to him – but of course that “looking up” is metaphorically speaking, since physically Danny is the one who is always looking up at everyone else! His nickname may be “Little Dan,” but anyone who sees him play can easily notice that his impact is far from small. Again, what Danny lacks in stature, he certainly makes up for it with the size of his heart. Danny hopes to keep growing – literally and figuratively – as he and his teammates continue their season at Cathedral Prep. With Danny as the centerpiece of the team the next two years, the Crusaders are poised to be the David – or even the Danny – against any Goliath.